Western India constituent states of Rajasthan Maharashtra, Gujarat and Goa. Western India is blessed magnificent monuments, rich cultural heritage sites, diverse varied flora and fauna, magnificient palaces and forts and beautiful cities. 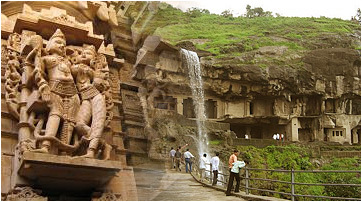 Rajasthan is the most popular tourist destination in India. Some of the famoust places to visit are Jaipur, Udaipur, Jodhpur, Bikaner, Jaiselmer, Mandawa, Ajmer, Chittaurgarh, Swai Madhopur..
Maharashtra: Mumbai capital of Maharashtra is also known as commercial capital of India. Mumbai city of hope, the city that never sleeps. Famous for its Bollywood film industry, tall skyscrapers, beaches, monuments and archetechtural marvels. . Pune is important part of Maharashtra famous for its educational institutes and technology advancements. Gujarat, the land of Mahatma Gandhi, is a vibrant state and known for its culture, people and tradition, natural beautiful and coast line. Gandhinagar is the capital of Gujarat. From Rann of Kutch to Daman and Diu, from Ahemadabad to Surat, from Vadodara to Rajkot are pride of Gujarat. Goa is internationally famous for its beaches, Portugese heritage and culture, UNESCO World Heritage 16th centuary Churches.